Battlefield Parkway Church of the Nazarene is committed to knowing Christ and making Him known. We believe the resurrection power of Jesus Christ is still saving and transforming lives today. It is our desire to reach our community for Christ and to lead adults, children and youth to experience a meaningful relationship with Him. In our services, we blend a variety of music including traditional hymns, contemporary Christian, southern gospel and praise and worship songs. No matter the style, our goal is to give Christ the adoration and praise! Originally from Dublin, Georgia, Pastor Joe Brown received a Bachelor of Arts degree in Religion at Trevecca Nazarene University and a Master of Divinity at Nazarene Theological Seminary. On February 15, 1988, he began his pastorate at Battlefield Parkway Church of the Nazarene in Fort Oglethorpe, Georgia. In the thirty years of serving at Battlefield Parkway as the senior pastor, the mission has remained the same. That mission is to win people to Jesus Christ and to help people grow in their knowledge and understanding of Him. Pastor Joe Brown is a serious life-long student of the Word. His teaching style of preaching challenges and inspires others to follow, love and serve Christ whole heartedly. Under his leadership, the people at BPCN are encouraged to get connected in the life of the church by serving. “Pastor Joe” and his wife Jean have been married for forty-one years and are very proud of their three daughters. The Browns also enjoy nine beautiful grandchildren. Pastor Joe and Jean make their home in North Georgia. Contact: pastorjoe@bpcnaz.org or click the button below! In 2007, Rhonda’s calling led her to serve as a worship leader in a local church setting, and doors also opened for her to serve on a broader platform by means of songwriting, recording and releasing Christian music. By 2009, opportunities in the area of Christian writing and media emerged. Rhonda served as an editor of a Christian music magazine and had articles published in several national publications. However, In January 2015, Rhonda was offered the assignment of her dreams and prayers—Battlefield Parkway! She currently serves as a staff pastor in the areas of worship, weekday ministries and pastoral care. Rhonda is a student at Nazarene Bible College, holds a district minister’s license and is working toward ordination in the Church of the Nazarene. Rhonda and her husband, Eric, are celebrating thirty years of marriage this year. The Fryes adore their three grown children, they spoil two beautiful granddaughters, and have fun chasing Beau Biscuit, their goldendoodle. God is good. Jeremy D. Young accepted the invitation to come on board the BPCN staff in January 2017. He was born and raised in Bethany, Oklahoma, learning from an early age how to off-road, fish, and evade tornados. He attended Southern Nazarene University, where he graduated in 2006 with a bachelors degree in Christian Education. He spent ten years in Orlando, Florida doing youth ministry and homeless outreach. Jeremy was ordained on the Florida Nazarene District in April 2011. The blueprints of his ministry revolve around Acts 2:42 - “They devoted themselves to the apostles’ teaching and to fellowship, to the breaking of bread and to prayer.” He believes that an effective ministry embraces this model. When students commit to deepening their knowledge of Scripture, to doing life together, to remembering the sacrifice Jesus made for them on the cross, and to walking daily with God in conversation and action, the youth ministry will experience real transformation. He loses track of time editing videos, road-tripping, listening to his favorite band Thousand Foot Krutch, watching college football (specifically the Oklahoma Sooners! ), hiking, exploring, writing, and having conversations in coffee shops. Jeremy is engaged to Abbi and that makes him the happiest guy in the world. Pastor Richie Stone has been an active member of Battlefield Parkway Church of the Nazarene for over 15 years. He and his family have been a part of children’s ministry from the beginning serving as a Sunday School teacher and Wednesday night leader. Richie accepted the call to children’s ministry and is serving as Head of Children’s Ministry and is currently taking Ministry Preparation classes through Nazarene Bible College. Children’s Ministry is a big part of Battlefield Parkway Church of the Nazarene and Mr. Richie shares God with our children each week. Mr. Richie teaches the children on Sunday mornings during Children’s Church, Wednesday nights he serves as AWANA commander, and shares chapel time with Noah’s Ark after-school program. 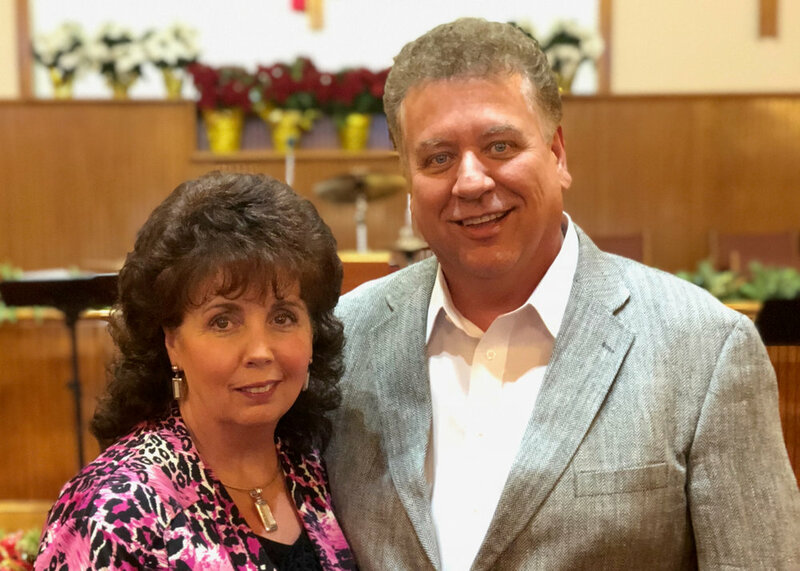 Pastor Richie and his wife Trina have been married 26 years, they have three children, Shelby, Abbi, and Jake who all help in the church in children’s and youth ministry. Mr. Richie loves his church and his Georgia Bulldogs and is always working to share Jesus with the children of our church. David Debord was born in Lafayette, Ga. in 1962 and has lived his entire life in the North Georgia area. He was blessed to be born and raised in a Christian home. When he was 8 years old he invited Jesus into his heart and He saved him. After becoming saved he soon became a member of the Church of the Nazarene. David graduated from Lakeview-Ft. Oglethorpe High School in 1980. He was married in 1984 to his beautiful wife Bobbie. God has blessed them with 2 children, 3 grandchildren and 6 great-grandchildren. He felt God calling him into the ministry and completed the Ministry Preparation Program through Nazarene Bible College and was ordained by the Church of the Nazarene in June 2016. Currently he serves as the Adult Ministries Pastor at BPCN. He enjoys reading and watching the “old” black and white television shows and movies. God, who is holy, calls us to a life of holiness. We believe that the Holy Spirit seeks to do in us a second work of grace, called by various terms including "entire sanctification" and "baptism with the Holy Spirit"-cleansing us from all sin, renewing us in the image of God, empowering us to love God with our whole heart, soul, mind, and strength, and our neighbours as ourselves, and producing in us the character of Christ. Holiness in the life of believers is most clearly understood as Christ-likeness. We are a sent people, responding to the call of Christ and empowered by the Holy Spirit to go into all the world, witnessing to the Lordship of Christ and participating with God in the building of the Church and the extension of His kingdom (Matthew 28:19-20; 2 Corinthians 6:1). Our mission begins in Worship, ministers to the world in evangelism and Compassion, encourages believers toward Christian maturity through Discipleship, and prepares women and men for Christian service through Christian higher education. The statement of mission contains historical essentials of our mission: evangelism, sanctification, discipleship, compassion. The essence of holiness is Christ-likeness. © Copyright 2017 Battlefield Parkway Church of the Nazarene, All Rights Reserved.